This story was written by David Rogers. The Senate stopped in its tracks Tuesday with the news of Sen. Edward M. Kennedy's illness - not because a malignant brain tumor means he will be a missing vote or an absent committee chairman but because the Massachusetts Democrat is such a part of the place that his mortality reminds the Senate of its own. "He captures all of what is exciting about the Senate," said Patrick Griffin, a former top Democratic leadership aide. "It's not just how good he can be, but he shows how good the institution can be. … The threat to his mortality is a threat to all that is vibrant and possible." Sen. Robert C. Byrd (D-W.Va.), a Kennedy rival years ago, wept openly on the Senate floor. Connecticut Sen. Chris Dodd, Kennedy's longtime sidekick, choked up even as he promised reporters, "He is a strong guy, has a great heart, and we are confident he will be back." "He is the only senator who could bring tears to my eyes when I was presiding and he rose to speak on the floor of the Senate," former Democratic Sen. Bob Kerrey of Nebraska told Politico. "There is something in the tone of the voice and the undisguised passion." That same passion once made Kennedy a polarizing force in national politics. 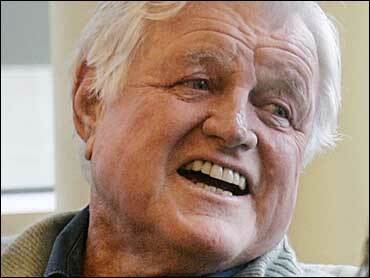 But Kennedy is a man who discovered himself in the Senate, just as the Senate discovered more in him. Elected in 1962, Kennedy will be forever identified with his slain brothers and the liberal civil rights and anti-poverty battles of that era. But in the decades since, his real strength has been his ability to renew himself through his mastery of issues and the changing personalities of the Senate. His booming voice fills the chamber when he speaks from his desk, always in the back row on the Democratic side but a gathering point over the years for younger members. Thus, his early endorsement of Sen. Barack Obama had immense symbolic importance as the young Illinois Democrat sought to establish himself against his more established rival, New York Sen. Hillary Rodham Clinton. Few senators can read a vote better than Kennedy, and his personal skills have become a huge asset for him as Washington has shifted away from his liberal activism of the 1960s. His energy is legendary. He once jumped out of a car at a traffic light to corral a House Democrat on immigration legislation. Looking for some help on a defense issue - and discovering that the father of a House Appropriations Committee aide was ill in a facility on Cape Cod, Mass. - Kennedy surprised the family by showing up for a visit. Republicans like former Senate Majority Leader Trent Lott (R-Miss.) came to Congress railing against the Kennedy name, but they treasured small gifts from the senator - or kindnesses in the course of legislation. Sen. Chuck Grassley (R-Iowa) won his seat in the Senate in 1980 at the expense of an old Kennedy friend, former Sen. John Culver. But after first finding Kennedy distant, Grassley collaborated with the Massachusetts Democrat on health care legislation, most notably the Family Opportunity Act to extend Medicaid coverage for special needs children with high health care costs. "He always gave me a lot of encouragement to get it done. ... It took us six years," Grassley recalled Tuesday. Grassley marveled that he had come to know Kennedy so well despite the fact that the two men came from opposing parties and never even sat on the same committees. "For [a Democrat] I didn't serve on a committee with, I think I can say I had a better relationship with Kennedy than with anybody else." Outside the Senate, Kennedy has worked closely with President Bush's administration on immigration and education reform proposals, and he enjoys a lasting relationship with House Minority Leader John A. Boehner (R-Ohio), with whom he sponsors an annual charity event for inner-city Catholic schools. Kennedy's own run for president in 1980 - when he challenged and then lost in the primaries to President Jimmy Carter - was a dismal failure. And as the nation shifted right, with Carter losing to Ronald Reagan, Kennedy was dismissed by many as a failed - sometimes foolish - relic of the past. He hurt himself further with a penchant for drinking and night life that better resembled Falstaff than Prince Hal. But in time, he found himself again in the Senate and is now widely regarded as the best legislator of his generation. "If you took a vote of the 535 members of Congress, he would win 3-1," said Kerrey. "Competence counts." Kennedy is an important player in three committees: Judiciary, Armed Services, and Health, Education, Labor and Pensions, two of which he has headed. No one Tuesday could predict when he would return. One of his major priorities this summer had been to move ahead with mental health parity legislation that has cleared the House. Humor and practical jokes are very much a part of Kennedy's style. In the sadness of Tuesday, they provided one source of comfort. Kerrey remembered a time, years ago, when a long series of Thursday night votes had pushed senators past time to catch commercial flights home to the Northeast. Sen. Frank R. Lautenberg (D-N.J.) arranged for a private plane for himself, Kennedy, Dodd and then-Sen. Claiborne Pell (D-R.I.), with the understanding that they would all settle up later. But the next week, Kennedy managed to secure a few sheets of Lautenberg's stationery and sent false bills - ostensibly from the wealthy New Jersey Democrat - to himself and the two others. Kennedy assigned different amounts to each senator: the lowest sum for himself, more for Dodd and still more for the often aristocratic Pell. Things almost spun out of control when Pell challenged the unwitting Lautenberg, and a greatly amused Kennedy had to own up to the joke. Kennedy uses humor to poke fun at himself as well. Years later, after Kerrey had left the Senate but was considering a run for the Senate again from Nebraska, he got a phone message from Kennedy. The Massachusetts liberal urged Kerrey to run and promised to make him a lead sponsor of Kennedy's immigration bill - which provoked such an uproar last year. "He could barely keep from laughing as he said, 'That should get you elected easily,'" Kerrey said. "I wish I had kept the tape."